A pro-level DJ controller at a pro-level price. It might be expensive but the RZ is a seriously well-equipped piece of kit. Solid build quality with arguably the best jog wheels of any DJ controller. Workflow is still heavily reliant on the laptop screen. Pioneer's rekordbox librarian software has long been a staple tool for many DJs, allowing them to organise, tag and analyse digital music files before transferring them to CD or USB, ready to be played on Pioneer equipment complete with pre-prepared metadata and beat grids. The company has produced its fair share of controllers too, although - until late last year - these have always relied on third-party applications. That changed with the release of rekordbox DJ, an expanded version of the library application which added player, mixing and performance tools to directly rival the likes of Traktor and Serato. Released alongside a range of software-specific controllers, the move changed rekordbox into a fully-integrated digital DJing platform, which aims to bridge the gap between the laptop and the CDJ. As the flagship model of the launch range, the DDJ-RZ is billed as a fully-spec'd controller combining two CDJ-style track controllers, a four-channel mixer, 16 performance pads and a built-in Osc Sampler. First impressions upon unboxing are that - as is generally the case with Pioneer DJ gear - you get what you pay for in terms of quality. Although the unit feels slightly more lightweight than you might expect, given its size, it's clearly built to withstand regular club use, and the various rotaries and controls feel rugged and sturdy. In fact, many elements of the RZ have been imported directly from Pioneer's Nexus range, most notably the jog wheels, which are identical to those found on the CDJ-2000NXS and, as such, are instantly some of the best-feeling jog wheels we've used on any DJ controller. They're made of sturdy aluminium and feel very responsive, and feature the same Jog Adjust controls as their CDJ counterparts, meaning they can easily be adapted to suit both dexterous scratch DJs and more ham-fisted mixers. The sound has a level of power and clarity that, frankly, no other DJ brand can match right now. The RZ's 'pro' credentials are further cemented by a broad range of club-friendly connections. Around the back the mixer has six analogue inputs and two master outs (both XLR and RCA), two mic inputs and a booth out. There are two headphone outputs along the front edge too, quarter-inch and mini-jack - a blessing for those of us with a habit of regularly losing headphone adaptors! The mixer section of the RZ can operate standalone, so the unit can act as a hub for up to four CDJs or turntables even when not hooked up to a laptop. It features built-in DVS support too, so it's possible to add two additional channels of rekordbox DJ control. 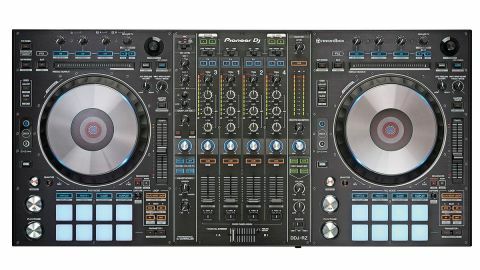 The mixer's most obviously pro-friendly feature, however, is its dual USB ports, which allows easy changeovers between two laptop DJs without the need to stop the music. In use the RZ is pleasantly intuitive. Once rekordbox DJ and the appropriate drivers are installed on your computer, it's a plug-and-play affair, offering instant access to pretty much every element of the software. Together, the software and controller are capable of a lot - too much to go into in this review. As you'd expect, all your basic browsing, transport and mixing functionality is within easy reach and all works seamlessly. Each deck has a rotary to the top right for scrolling through the track library, accompanied by a pair of buttons for navigating and loading. A Shift press allows users to take advantage of rekordbox's Related Tracks functionality, which - with a bit of preparation - will instantly throw up a selection of tracks with similar bpm, key and tagging info. Transport wise, alongside each jog wheel, the RZ features the same solid Play and Cue buttons as Pioneer's CDJ range, along with a smaller Sync button. There's a standard tempo fader to the right of each jog wheel, accompanied by a button for setting the master tempo, which is also used to adjust the tempo fader range, via a Shift press. There's a Needle Search touchstrip above each jog too, which allows for quick scanning through tracks. Each deck also features a pair of buttons for adjusting a track's beat grid, along with a pair of buttons for engaging and adjusting Slip mode, which allows for tracks to continue playing in the background while Slicer or Loop effects are engaged. There's a trio of FX controllers along the top of each deck too, for engaging and adjusting effects, along with a rotary for controlling the tempo of Beat and Release FX. Down the bottom, each deck features eight multi-mode pads, which are accompanied by a looper section and transport controls for rekordbox's built-in sequencer. Finally, to the edge of each deck is a deck selector switch for flipping between decks one/two and three/four. One interesting feature here is the ability to select both decks at once, via Dual Mode, and control two decks at the same time with each controller. The RZ's mixer is slightly trimmed down compared to Pioneer's flagship standalone offerings, ditching some of the built-in effects and send/return channels in favour of the performance controls in rekordbox DJ. Other than that though, you get all the quality and functions you'd expect from a club level mixer - a responsive three-band EQ, DJ-style filter knobs and rugged magnetic faders. Alongside the software effects from rekordbox DJ, the RZ's mixer section also features a built-in Sound Color FX strip, with reverb, phase, pitch and filter effects. This is joined by the OSC Sample trigger, which is able to fire off four preset samples: Noise, Sine, Siren and Horn. This is a cool and well-implemented tool, although it's not hard to see the sounds getting old quickly with overuse. In all, the RZ is a hugely flexible controller, the capabilities of which justify its top-end price. Its intuitive workflow means that, for the most part, navigating and understanding this massive range of functions feels straightforward and, particularly for those used to DJing on other Pioneer gear, there's no steep learning curve to break the flow of your DJ sets. The 'pro' feel carries through to the RZ's sound too, which comes courtesy of built-in Wolfson D/A converters that make the RZ easily one of the best-sounding DJ controllers we've tried. The sound has a level of power and clarity that, frankly, no other controller brand can match. The one area where the DDJ-RZ falls short is in its lack of screens. It does, in fact, feature a pair of displays on the top of its two jog wheels. These, however, are just used to display the jog wheel mode, and it feels like a massive missed opportunity not using them to display some basic track info (ie. name, BPM, time left to play). It's a shame because the RZ is so fluid and intuitive in use that it's just a little disappointing being drawn back to the laptop every time you need to check track info or load a new song. Still, even taking that into account, this is easily one of the best digital DJ set-ups available today. It's a truly pro-quality experience that justifies its top-end price point.